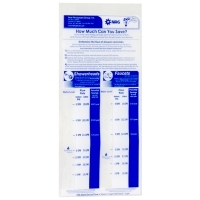 This Water Flow Rate Bag allows you to calculate your gallons per minute usage of showerheads , faucet aerators and kitchen aerators. Once you calculate the usage of your existing devices, you can determine how much water you can save by switching to water efficient showerheads and aerators. To use simply place the bag under the shower head or aerators and turn on the water for 5 seconds. The lines on the bag act as a gallons per minute calculator. While older "water-saving" showerheads used to limit the flow to 2.5 gallons of water per minute, today's high performance water-saving showerheads use no more than 1.8 gallons of water per minute, yet still deliver a satisfying spray. With kitchen faucet aerators the flow need be no more than 1 to 1.5 gallons per minute, and the savings can be enhanced if the aerator includes an off-value (allowing for the temporary interruption of the flow). Because bathroom faucets are primarily used for washing hands, brushing teeth, and shaving, even less water is needed here, with today's water-saving bathroom faucet aerators able to allow a maximum flow of just 0.5 to 1.0 gallons per minute of water.